This weekend, the state Democratic Party convention will be held in Eugene. DNC Chairman Howard Dean will headline the weekend's events - along with Ron Wyden, Darlene Hooley, Peter DeFazio, and many other elected officials and grassroots Democrats. When Governor Howard Dean was elected to lead the Democratic National Committee, his first words were, "This is not my chairmanship. It is yours." It was a simple but profound statement. No longer would our party be governed by a top down, one-size-fits-all strategy. Instead, Governor Dean has empowered state parties and returned decision making in our party to where it belongs - with the people. Governor Dean has kept his word. Now that the primary is over and the stage is set for November, it is time for Oregon Democrats to stand and deliver. Together, we prevailed in 2004 -- and with your help, we'll do it again. The early-registration deadline has been extended to tomorrow - Tuesday, May30 - so be sure to pick up your tickets. Speaking of which, if anyone from PDX is going down to Eugene drop me a line at [email protected] because I'm heading down and need a ride. I'd be more than happy to compensate for gas. But alas...I'll be a soccer mom that weekend while my daughter's team participates in the State Games of Oregon. Howard Dean and most Democrats are just another face of EMPIRE. We need new ways of living and being that go beyond Empire and that revolution must be led by us. 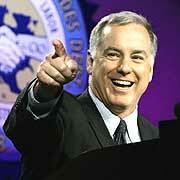 Sorry, but Howard Dean is just another destraction. The Democrats will not save you. The Democrats will not save you. I said it twice so it will sink in. Bill Clinton was just another man of the Empire. GWB is so bad that most of you forget that Clinton expanded the death penalty, kicked tons of people off welfare, shot missiles at sovereign nations, maintained a huge military, brought us NAFTA and GATT. Lead us, O Great Brian. The Roman empire lasted 500 years, twice as long as the US. Hail Caesar! I have heard Howard Dean say that it is imperative that Iran be denied a nuclear weapon. It's that kind of talk which will quash opposition within the Dem party as to whatever the GOP intends to do about Iran. Also, due to the fact of Iran being YEARS away from actually building a bomb, isn't this all a bit premature, anyway? If Iran does eventually decide to build a nuclear weapon, I would hope that country would withdraw from the non-proliferation treaty and then go ahead and build it. This would be perfectly within Iran's legal rights to do so. And the West should have no trouble with a country over an issue wherein that country is acting legally.